Q: Yesterday, US Senator Rand Paul, when talking about the DPRK's threat to reconsider its summit with the US in an interview with the CNN, said that from the perspective of the DPRK, they gave up three American prisoners and they are ending military weapons testing. They are giving and haven't seen a little bit on the other side from the US. He added that this is just the DPRK responding and pushing back in their way, but he is still optimistic about the upcoming talks between the DPRK and the US. What is your comment? A: I have noted relevant reports. Senator Rand Paul also sits on the Senate Foreign Relations Committee. He chose to look at the matter from the perspective of the DPRK and proposed to show mutual understanding and compromise. This way of thinking and attitude are worth noting. Not long ago, an important step to resolve the Korean Peninsula issue was taken in the right direction, thanks to the concerted efforts of all relevant parties. We keep stressing and I also reiterated yesterday that the current momentum of dialogue and détente on the Korean Peninsula does not come by easily and should be cherished by all. You may all have noticed that the DPRK has made important efforts, including its announcement to stop nuclear and missile tests and close the Punggye-ri nuclear test site. They have demonstrated their goodwill to pursue denuclearization of the Korean Peninsula and establish mutual trust with other parties as well as their sincerity to move forward the political settlement of the Korean Peninsula issue through talks. These efforts shall be acknowledged, encouraged, welcomed and supported by the international community and certainly deserves corresponding efforts from the other party. 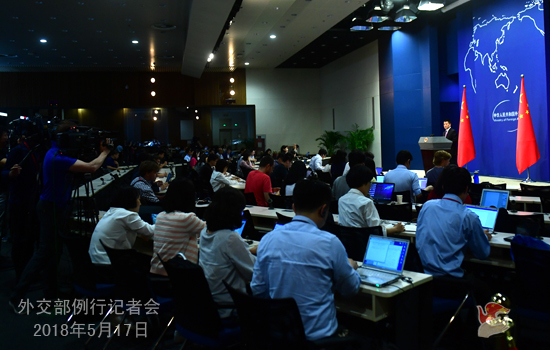 Just like State Councilor and Foreign Minister Wang Yi said yesterday in Paris, we shall never allow the history of one party showing flexibility and the other taking an increasingly tougher stance to repeat itself. To resolve the Korean Peninsula issue in a political way calls for the concerted efforts of all relevant parties. 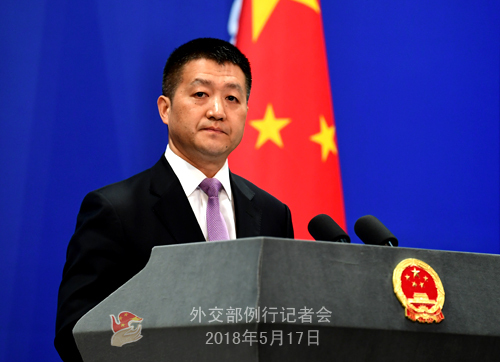 China always maintains that this political process shall be advanced through dialogues, and all parties' concerns shall be addressed in a balanced way, including the legitimate security concerns of the DPRK. Senator Paul said that he is still optimistic. We also hope that the US and the DPRK could seize the opportunity and remain committed to building mutual trust and engaging in dialogues, thus making positive contributions to the denuclearization of the Korean Peninsula and the enduing stability in the region. Q: According to reports, the Iranian Minister of Petroleum said that China would continue with its cooperation with Iran on oil imports after the US withdrawal from the Joint Comprehensive Plan of Action. Can you confirm this? A: China and Iran maintain normal trade and economic ties all along, including in the area mentioned by you. China will continue with such trade and economic ties with Iran on the basis of not violating its own international obligations. Q: With regard to the Korean Peninsula nuclear issue, US National Security Adviser John Bolton proposed that the DPRK should accept the Libya model of complete nuclear disarmament in return for compensation, which was rejected by the DPRK. Does China endorse the Libya model? Please tell us China's position on it. A: I am certain that you have never heard us saying that we endorse the Libya model. I have made our position clear in my response to the first journalist and I can repeat it for you. 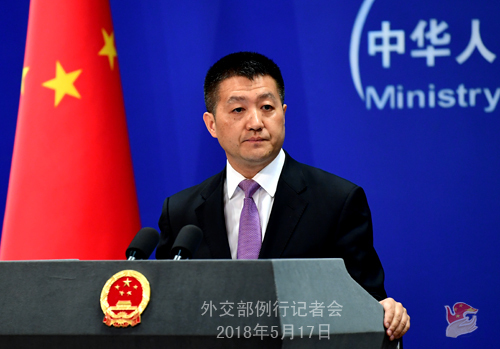 China always maintains that all relevant parties should engage in dialogues to advance the political settlement of the Peninsula issue and address their concerns in a balanced way, including the legitimate security concerns of the DPRK. Follow-up: The DPRK proposed that all relevant parties should take phased and synchronized measures to realize denuclearization and promote the political settlement of the Peninsula issue. Does China support the DPRK's proposal? A: As I said just now, we believe that the concerns of all parties should be addressed in a balanced way when advancing the political settlement of the Korean Peninsula issue. During this process, all parties could seek out the most effective way to resume dialogue and address concerns in a synchronized way, thus contributing to resolving the issue through dialogues. China is open to any effective way that could achieve this end. Q:The Vietnam unit of the Russian oil firm Roseneft is now drilling in an area of the South China Sea that China claims. They are concerned about China's possible response. What is your comment? A: China has noted relevant reports. I would like to reiterate that no country, organization, company or individual can, without the permission of the Chinese government, carry out oil and gas exploration and exploitation activities in waters under Chinese jurisdiction. We urge relevant parties to earnestly respect China's sovereign and jurisdictional rights and not do anything that could impact bilateral relations and regional peace and stability. Q: Recently, there was a case about a 19-year-old Sudanese girl, Noura Hussein, who was sentenced to death for killing her husband. Many organizations, including the EU and the UN, have expressed their concern and called on the Sudanese authority to abolish death penalty. Since China is one of those that have closest economic and diplomatic ties with Sudan, do you have any comment on that? A: I just learned of this news after you described it for me. It is a specific case happening in another sovereign state. I need to get all the facts straight before answering your question. If the EU and other organizations are making reasonable requests, they can suggest them to the Sudanese government. If the requests not reasonable, the principled position of the Chinese government is non-interference in other countries' domestic affairs, which is applicable to all countries.